Finally there's a real simple home remedy for toenail fungus. Are you embarrassed to wear sandals or go barefoot on the beach? Sure there are lots of home remedies for toenail fungus but this one works! Toenail fungus is a type of fungi very much like what causes mold and grows in your bathroom. It survives and grows in damp areas and very common in the United States. It's estimated that 48% of the population in the U.S. suffer from this disorder either in their toenails or fingernails. Vicks VapoRub also works great for Athlete's Foot. That's because of the herbal ingredients and essential oils that are some of the ingredients in Vicks. Another really good treatment for toenail fungus and Althlete's Foot is Vinegar & Listerine. Here are some recipes to treat toenail fungus with vinegar & Listerine footbaths. The nails can become yellowish or brownish and also become very thick over time. The nails start to grow crooked, ingrown and painful. Clipping and grooming the nails can be difficult and this makes them look dirty and ugly. So people hide their nails by covering them with shoes and socks all the time. This starts a vicious circle by giving the fungi a damp and dark place to grow. It's extremely rare for children to suffer from this nail fungus, probably because children love to go barefoot. This real simple and very inexpensive home remedy for toenail fungus will require a lot of patience and persistence but it does work. All you're going to need is a jar of Vicks VapoRub, a few pairs of socks you won't mind disposing of and patience. 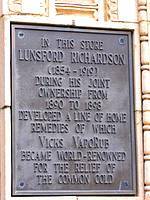 Vicks VapoRub was developed in the late 1800s by, Lunsford Richardson, as a home remedy to relieve the symptoms of the common cold. Anybody growing up in the United State can recognize that blue jar and especially the smell of Vicks. It's still used to this day to relieve symptoms like stuffy nose and chest congestion. I'm sure Lunsford Richardson would be surprised to know that his home remedy for the common cold is now a popular home remedy for toenail fungus. Of course I have no idea who discovered rubbing Vicks VapoRub on their feet to kill the fungi that causes toenail fungus but I'm sure there are many people that would like to thanks them. From what I'm told all you have to do is rub Vicks VapoRub on your feet every night and cover your feet with socks every night before going to bed. The actual home remedy for toenail fungus actually takes several months to kill the fungi but once you start seeing the sign of the fungus clearing up it never returns. The toenails will become clear and thin again and start growing out straight. Give it a try what do you have to lose? Well maybe a few pairs of sock you don't want to wear because they smell like Vicks VapoRub. It's a lot safer than taking all those drugs advertised on TV showing all those creepy little gremlins living under your toenails (I gotta tell you, that commercial always creeped me out). You have to admit it really is a real simple home remedy for toenail fungus.